Concerned about potentially toxic mold spores in your air? 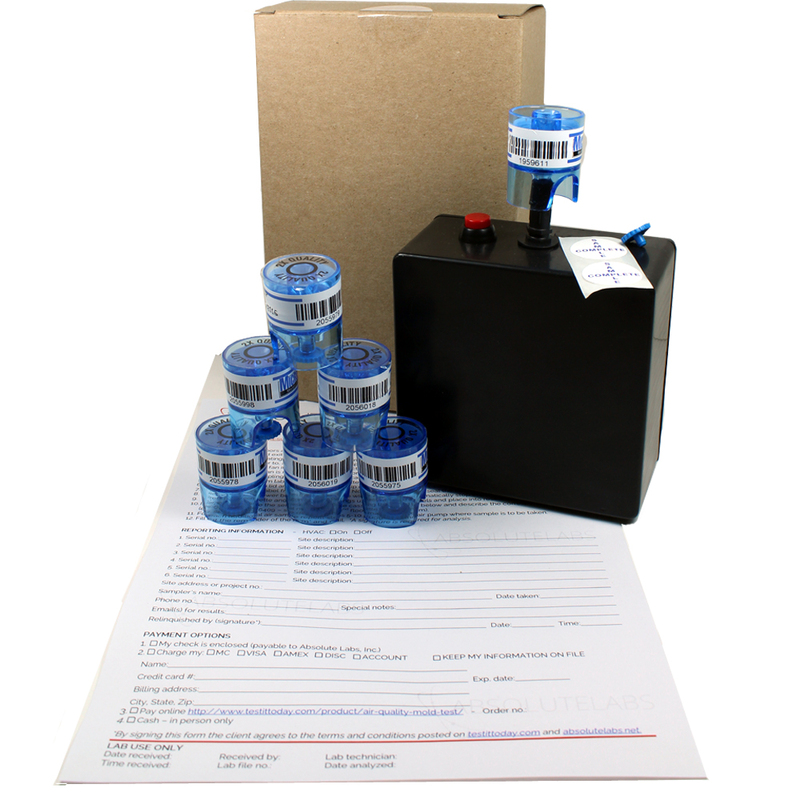 The Air Quality Mold Test Kit allows you to collect up to 10 air samples. Air samples are taken using spore traps to capture airborne spores in your living spaces. Once returned, accredited aerobiologists examine your air samples for mold types and potential toxicity. Unlike other mold test kits, the Air Quality Mold Test Kit provides you with the concentration of mold in your air (spores per cubic meter). Knowing the concentrations of mold types is essential for understanding the true fungal ecology of your living spaces. In addition, spore traps capture difficult-to-culture spores that elude traditional petri dishes. We accept samples from clients nationwide. Buy your Mold Test Kit by selecting the number of samples you will need analyzed. Shipping, return shipping and taxes are included. Results guaranteed in 2-3 business days after receipt of samples. Call for rush result pricing. An exterior reference sample is required with all orders*. So if you order 3 samples, 2 will be inside and 1 will be outside – please order accordingly. *Note: If you’re sampling a wall or ceiling cavity please call before ordering and we will provide you with instructions and a cavity probe. 1. 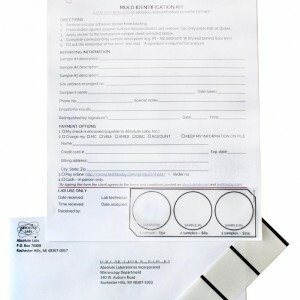 Buy your Mold Test Kit by selecting the quantity of samples you want tested. Note: An outdoor air sample is required for interpreting results. 2. You will receive your Mold Test Kit by ground shipping (2-3 days). For rush shipping please contact us for a quote. 3. Follow the air sampling guide included with your Mold Test Kit. Mail all the kit contents back to Absolute Labs (return shipping is included). A PDF report will be sent to your email. Results include mold types (genus level), classification as toxigenic or non-toxigenic, and concentration of airborne spores per cubic meter of air. Air quality results can be used to get quotations from mold remediation firms or as post most-remediation clearance testing. Mold growth occurs when there is excessive moisture on building materials. Molds in indoor living spaces are commonly found on plant-based materials like wood and paper-backing on drywall. Mold growth can also occur on inorganic building materials including cement, concrete, plaster and plastics if given the right conditions. Because certain mold types are capable of producing harmful mycotoxins it is important to monitor for these mold types (classified as toxigenic) in your indoor living space. Do you suspect abnormal levels or types of mold are in your home? Then the Air Quality Mold Test Kit can be used to take air samples for analysis. Test results include mold types (genus level) and their concentration in your air. Each sample is evaluated for potential toxigenic mold types, including the notorious “Black Mold” (Stachybotrys chartarum).